SonicBonded Mat Pads control spills and overspray to help keep floors dry and safe. A random assembly of large-diameter MeltBlown poly fibers creates a lofty layer. 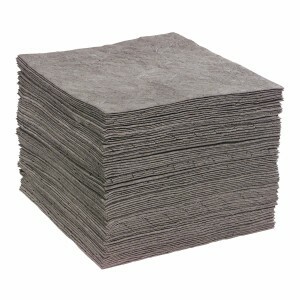 Mat absorbs high volumes of liquid fast. Great for catching overspray or soaking up spills. Ultrasonic bond points fuse layers of fibers together Mat keeps its shape even when completely saturated. Top layer of lint-free SpunBond fabric provides extra strength. "Dimples" add fast-wicking power. SpunBond top layer allows for better-defined perforations and cleaner, easier tear-offs. Pads are perfed vertically at 7.5". Color-coding helps you visually identify the right sorbent for your needs. Grunge-hiding Gray signifies universal sorbency for oils, coolants, solvents and water.